Researchers analyzed the language recorded by body cameras during police stops, and concluded that police officers talk more respectfully to White residents than non-White residents. The study, published Monday in the Proceedings of the National Academy of Sciences, included 183 hours of body camera footage taken during 981 routine traffic stops in April 2014 by 245 different officers in the Oakland Police Department. "Police officers speak significantly less respectfully to black than to white community members in everyday traffic stops, even after controlling for officer race, infraction severity, stop location, and stop outcome. This paper presents a systematic analysis of officer body-worn camera footage, using computational linguistic techniques to automatically measure the respect level that officers display to community members. This work demonstrates that body camera footage can be used as a rich source of data rather than merely archival evidence, and paves the way for developing powerful language-based tools for studying and potentially improving police–community relations. " The study included random selections of 312 utterances spoken to black residents and 102 utterances spoken to white residents. Next, 10 volunteers rated each interaction without knowing the names, races, or identifying information of the police officers. Then, the researchers used a computer model to analyze the ratings based upon scientific literature about respect. "... white community members are 57% more likely to hear an officer say one of the most respectful utterances in our dataset, whereas black community members are 61% more likely to hear an officer say one of the least respectful utterances in our dataset. (Here we define the top 10% of utterances to be most respectful and the bottom 10% to be least respectful.) This work demonstrates the power of body camera footage as an important source of data, not just as evidence, addressing limitations with methodologies that rely on citizens’ recollection of past interactions..."
"The racial disparities in officer respect are clear and consistent, yet the causes of these disparities are less clear. It is certainly possible that some of these disparities are prompted by the language and behavior of the community members themselves, particularly as historical tensions in Oakland and preexisting beliefs about the legitimacy of the police may induce fear, anger, or stereotype threat. However, community member speech cannot be the sole cause of these disparities... We observe racial disparities in officer respect even in police utterances from the initial 5% of an interaction, suggesting that officers speak differently to community members of different races even before the driver has had the opportunity to say much at all." "Regardless of cause, we have found that police officers’ interactions with blacks tend to be more fraught, not only in terms of disproportionate outcomes (as previous work has shown) but also interpersonally, even when no arrest is made and no use of force occurs. These disparities could have adverse downstream effects, as experiences of respect or disrespect in personal interactions with police officers play a central role in community members’ judgments of how procedurally fair the police are as an institution, as well as the community’s willingness to support or cooperate with the police." "We're also hoping it inspires police departments to consider cooperating with researchers more. And facilitating this kind of analysis of body camera footage will help police departments improve their relationship with the community, and it will give them techniques for better communication... When people feel they're respected by the police, they are more likely to trust the police, they are more likely to cooperate with the police, and so on and so forth. So we have reason to expect that these differences that we find have real-world effects." I look forward to future studies. What are your opinions? “Smartphone penetration has reached 86% of U.S. broadband households, so it is a mature market, with users, particularly younger consumers and iOS users, exploring more intelligent features and interfaces, including voice control... The growing consumer interest in voice control features is driving this technology into new IoT areas... Following Apple’s lead with Siri, other brands have created ‘personalities’ for their voice-control solutions, like Alexa for Amazon Echo and Cortana for Windows Phones." Usage is higher among younger persons. 48 percent of smartphone users ages 18-24, use voice recognition software, usage of the “Siri” voice recognition software increased from 40 to 52 percent between 2013 and 2015. In total, about 15 percent of all U.S. broadband households use Siri. About 70 percent of smartphone owners who use voice recognition are satisfied. 38 percent said they are very satisfied, and 9 percent said they are not satisfied. More than 70 percent watch short streaming video clips, and more than 40 percent watch long streaming videos. 36 percent use WiFi calling. 24 percent stream video from their phones to a second screen (e.g., TV, PC). Learn more in the "360 View: Mobility and the App Economy" report, or the press release, by Parks Associates. "Nearly 1 of every 6 current Honolulu Police Department officers have been taken to court over criminal or civil allegations of wrongdoing, ranging from excessive force to domestic abuse, according to a first-of-its-kind analysis by the Honolulu Star-Advertiser. Just since 2010, an officer has been arrested or prosecuted at the rate of one every 5.7 weeks... more than 330 officers, or nearly 16 percent of the 2,100-member squad, have been named as defendants in criminal cases, temporary restraining orders and wrongful-conduct lawsuits since joining the force. Most of the lawsuits alleged on-duty civil rights violations, while most of the TROs involved off-duty conduct... about 5 percent of officers account for a disproportionate share of complaints against police..."
"Of the 55 criminal cases from the past six years that the newspaper examined, more than half resulted in convictions or deferred pleas of guilty or no contest. The deferrals give the defendants the opportunity to keep their records clean if they stay out of trouble for a certain length of time. Most of the 18 officers whose pleas were deferred remain on the job. Only one of the 14 who were convicted is still an HPD officer." "Although the department has not been hit by the racial strife over high-profile fatalities that has rocked some mainland police forces, it has had a steady dose of controversial cases, including ones that have cost taxpayers millions of dollars in lawsuit settlements... Although the Star-Advertiser was unable to compare HPD’s 1-in-6 ratio with rates at other comparable departments, it was able to crunch numbers from a recent national study that Stinson and several of his Bowling Green colleagues published on officer arrests. HPD did not fare well. Using Google-based searches of news articles, the researchers compiled data on arrests from 2005 to 2011 involving officers at hundreds of law enforcement agencies across the country. Based on those data, HPD had the 10th-worst rate per 100,000 population among the more than 80 police departments with at least 1,000 full-time officers. It was 11th worst on a per-1,000 officers basis." Kudos to the Star-Advertiser for an informative report. Transparency matters. Accountability matters. 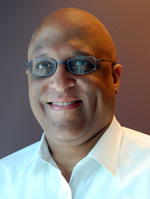 Read the Bowling Green State University (BGSU) announcement about the April, 2016 study by Philip Matthew Stinson, Sr., J.D, Ph.D. and associates titled, "Police Integrity Lost: A Study of Law Enforcement Officers Arrested" (Adobe PDF). The Star-Advertiser's report seems to highlight an opportunity for newspapers across the United States. I am sure that readers are curious about how their local police department rates. Ideally, follow-up studies will also include data about convictions. What do you think? About overall newspaper readership, 51 percent read the print version exclusively, 5 percent read the desktop version only, another 5 percent 5% read only the mobile version, and about 7 percent read both the mobile and desktop versions. "... looking at newspaper subscribers as the only readers of newspaper content misses an important part of the story. The share of newspaper readers who report reading a newspaper in digital form, or who have digital subscriptions, is not the same as the share of Americans more broadly who come across individual stories hosted on a newspaper’s website as they surf the web. The findings reported above are based on survey questions asked of individuals who self-reported reading a newspaper online or in print in the past 30 days. However, it does not include everyone who lands upon a newspaper website while searching for news information or following a link from an email or social networking post. These consumers of individual bits of information may not remember having read a newspaper, or have even realized that they did. (We have found that most people who read an article on a website do not read any other articles on that site in a given month, suggesting that this kind of incidental readership is common.) Indeed, as revealed in the digital audience section below, when it comes to all newspaper website visitors – not just subscribers – the newspapers analyzed all had more digital traffic than print subscribers." The "State of the News Media 2016" report also includes information about cable news, local TV news, network news, online news, alternative weeklies, podcasts, and more. "Broad demographic shifts in marital status, educational attainment and employment have transformed the way young adults in the U.S. are living, and an analysis of census data highlights the implications of these changes for the most basic element of their lives – where they call home. In 2014, for the first time in more than 130 years, adults ages 18 to 34 were slightly more likely to be living in their parents’ home than they were to be living with a spouse or partner in their own household." "The first is the postponement of, if not retreat from, marriage. The median age of first marriage has risen steadily for decades. In addition, a growing share of young adults may be eschewing marriage altogether. A previous Pew Research Center analysis projected that as many as one-in-four of today’s young adults may never marry. While cohabitation has been on the rise, the overall share of young adults either married or living with an unmarried partner has substantially fallen since 1990. In addition... employed young men are much less likely to live at home than young men without a job, and employment among young men has fallen significantly in recent decades. The share of young men with jobs peaked around 1960 at 84%. In 2014, only 71% of 18- to 34-year-old men were employed. Similarly with earnings, young men’s wages (after adjusting for inflation) have been on a downward trajectory since 1970 and fell significantly from 2000 to 2010. As wages have fallen, the share of young men living in the home of their parent(s) has risen." "For men ages 18 to 34, living at home with mom and/or dad has been the dominant living arrangement since 2009. 'In 2014, 28 percent of young men were living with a spouse or partner in their own home, while 35 percent were living in the home of their parent(s). For their part, young women are on the cusp of crossing over this threshold: They are still more likely to be living with a spouse or romantic partner (35%) than they are to be living with their parent(s) (29%). In 2014, more young women (16%) than young men (13%) were heading up a household without a spouse or partner. This is mainly because women are more likely than men to be single parents living with their children..."
"In 2014, 40 percent of 18- to 34-year-olds who had not completed high school lived with parent(s), the highest rate observed since the 1940 Census when information on educational attainment was first collected. Young adults in states in the South Atlantic, West South Central and Pacific United States have recently experienced the highest rates on record of living with parent(s). With few exceptions, since 1880 young men across all races and ethnicities have been more likely than young women to live in the home of their parent(s)." The methodology included decennial census data and large samples, typically 1 percent of young adults nationwide. "... risk assessments — are increasingly common in courtrooms across the nation. They are used to inform decisions about who can be set free at every stage of the criminal justice system, from assigning bond amounts... to even more fundamental decisions about defendants’ freedom. In Arizona, Colorado, Delaware, Kentucky, Louisiana, Oklahoma, Virginia, Washington and Wisconsin, the results of such assessments are given to judges during criminal sentencing. Rating a defendant’s risk of future crime is often done in conjunction with an evaluation of a defendant’s rehabilitation needs. The Justice Department’s National Institute of Corrections now encourages the use of such combined assessments at every stage of the criminal justice process. And a landmark sentencing reform bill currently pending in Congress would mandate the use of such assessments in federal prisons." "In 2014, then U.S. Attorney General Eric Holder warned that the risk scores might be injecting bias into the courts. He called for the U.S. Sentencing Commission to study their use... The sentencing commission did not, however, launch a study of risk scores. So ProPublica did, as part of a larger examination of the powerful, largely hidden effect of algorithms in American life. [ProPublica] obtained the risk scores assigned to more than 7,000 people arrested in Broward County, Florida, in 2013 and 2014 and checked to see how many were charged with new crimes over the next two years, the same benchmark used by the creators of the algorithm." "... in forecasting violent crime: Only 20 percent of the people predicted to commit violent crimes actually went on to do so. When a full range of crimes were taken into account — including misdemeanors such as driving with an expired license — the algorithm was somewhat more accurate than a coin flip. Of those deemed likely to re-offend, 61 percent were arrested for any subsequent crimes within two years." "In forecasting who would re-offend, the algorithm made mistakes with black and white defendants at roughly the same rate but in very different ways. The formula was particularly likely to falsely flag black defendants as future criminals, wrongly labeling them this way at almost twice the rate as white defendants. White defendants were mislabeled as low risk more often than black defendants." "... it criticized ProPublica’s methodology and defended the accuracy of its test: “Northpointe does not agree that the results of your analysis, or the claims being made based upon that analysis, are correct or that they accurately reflect the outcomes from the application of the model.” Northpointe’s software is among the most widely used assessment tools in the country. The company does not publicly disclose the calculations used to arrive at defendants’ risk scores, so it is not possible for either defendants or the public to see what might be driving the disparity... Northpointe’s core product is a set of scores derived from 137 questions that are either answered by defendants or pulled from criminal records. Race is not one of the questions..."
Formed in 1989, Northpointe is a wholly owned subsidiary of the Volaris Group. Northpointe works with a variety ot federal, state, and local justice agencies in the United States and Canada. The company's website also states that it also works with policy makers. Besides Northpointe, several companies provide risk assessment tools to courts and the judicial system. The National Center For State Courts (NCSC) provides a list of risk assessment tools (Adobe PDF). "There have been few independent studies of these criminal risk assessments. In 2013, researchers Sarah Desmarais and Jay Singh examined 19 different risk methodologies used in the United States and found that “in most cases, validity had only been examined in one or two studies” and that “frequently, those investigations were completed by the same people who developed the instrument.” Their analysis of the research through 2012 found that the tools “were moderate at best in terms of predictive validity,”... there have been some attempts to explore racial disparities in risk scores. One 2016 study examined the validity of a risk assessment tool, not Northpointe’s, used to make probation decisions for about 35,000 federal convicts. The researchers, Jennifer Skeem at University of California, Berkeley, and Christopher T. Lowenkamp from the Administrative Office of the U.S. Courts, found that blacks did get a higher average score but concluded the differences were not attributable to bias." I wonder if the biases found started in the data rather than in the algorithm. The algorithm may have been developed and tested using existing prison populations which are known to be skewed, plus overly aggressive policing via school-to-prison pipelines and for-profit prisons in many states. Both the State of Florida and Broward County have histories with school-to-prison pipelines. Plus, It seems crazy to make decisions about persons' lives based upon scores without knowing how the scores were calculated, and without adequate research or vetting of techniques. Transparency matters. "... has received 459 data breach notices from the first of the year through May 2, 2016, as compared with 327 through the same time last year. 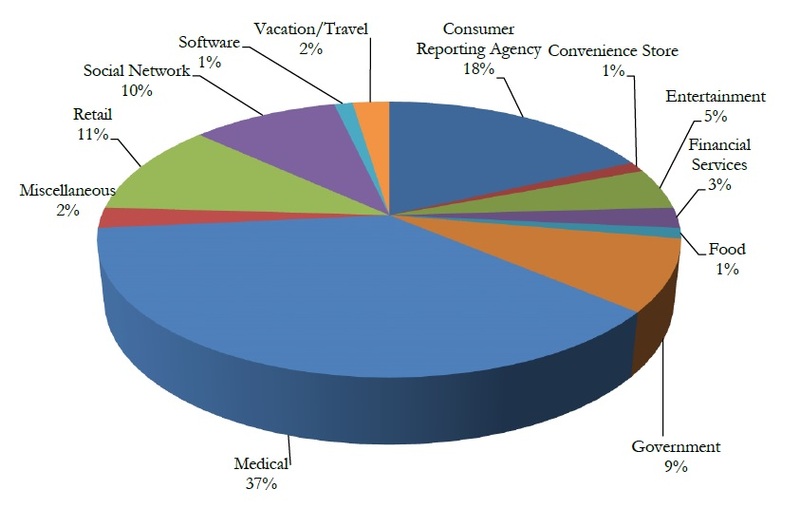 In the year 2015 alone, the office received 809 data breach notices. The office is expecting to receive well over 1000 notices for the year, a new record." The New York State Information Security Breach & Notification Act requires companies to provide notice to the Attorney General office and to affected consumers. Companies use an online submission form. Previously, notifications were submitted via postal mail, fax, or email. "... the number of reported data security breaches in New York more than tripled between 2006 and 2013. In that same period, 22.8 million personal records of New Yorkers were exposed in nearly 5,000 data breaches, which cost the public and private sectors in New York upward of $1.37 billion in 2013. In addition, the report also found that hacking intrusions – in which third parties gain unauthorized access to data stored on a computer system – were the leading cause of data security breaches, accounting for roughly 40 percent of all breaches." "1. Call the three credit bureaus (Experian, Equifax, and Transunion) and request a 90-day fraud alert be placed on your credit reports. 3. If you do find any inaccuracies, call the three credit bureaus and request a security freeze be placed on your credit reports. This may cost a nominal fee depending on the state that you are in and does not allow new credit lines to be processed until you personally unfreeze your credit. Even if you do not find any inaccuracies, you may want to consider putting a security freeze on your credit as a precautionary measure. 4. File your tax returns as early as possible to avoid an identity thief filing a tax return under your name in order to receive fraudulent tax refunds. 5. Contact the Social Security Administration and request your wage report to ensure that an identity thief has not reported fraudulent wages which you may have to pay taxes on if not resolved. 6. For more details on what to do if you have received a data breach notification letter, please read our ITRC Fact Sheet FS 129." Learn how to spot fake breach notices from scammers. To help residents confirm breach notifications, A few states (Maryland, New Hampshire, Vermont, Wisconsin) post online breach notices they have received. Comments? Opinions? If you know of any states that post breach notices online, please tell us below. "Approximately 5% of publicly reported data breaches led to class action litigation. The conversion rate has remained relatively consistent as compared to prior years... When multiple filings against single defendants are removed, there were only 21 unique defendants during the Period. This indicates a continuation of the “lightning rod” effect noted in the 2015 Report, wherein plaintiffs’ attorneys are filing multiple cases against companies connected to the largest and most publicized breaches, and are not filing cases against the vast majority of other companies that experience data breaches..."
"Choice of forum, however, continues to be primarily motivated by the states in which the company-victims of data breaches are based." "... the medical industry was disproportionately targeted by the plaintiffs’ bar. While only 24% of publicly reported breaches related to the medical industry, nearly 33% of data breach class actions targeted medical or insurance providers. The overweighting of the medical industry was due, however, to multiple lawsuits filed in connection with two large scale breaches... There was a 76% decline in the percentage of class actions involving the breach of credit cards... The decline most likely reflects a reduction in the quantity of high profile credit card breaches, difficulties by plaintiffs’ attorneys to prove economic harm following such breaches, and relatively small awards and settlements.."
57 percent of cases included sensitive personal information (e.g., Social Security numbers), 23 percent of cases included debit/credit card information, and 18 percent of cases included credit reports. The law firm reviewed lawsuits occurring during a 15-month period ending in December, 2015. Data sources included Westlaw Pleadings, Westlaw Dockets, and PACER databases. "However, decisions from a number of high-profile cases are likely to make it easier for consumers to bring suits against companies in the event of a data breach... For example, in July 2015, the Seventh US Circuit Court of Appeals, overturning a previous judgment, ruled that customers of Neiman marcus could potentially sue the retailer because they were at substantial risk of identity theft or becoming victims of fraud..."
Learn more about the Neiman Marcus class-action. Criminals hack corporate databases specifically to reuse (or resell) victims' stolen sensitive personal and payment information to obtain fraudulent credit, drain bank accounts, and/or hack online accounts -- injuries which often don't happen immediately after the breach. That's what identity thieves do. Hopefully, courts will take a broader, more enlightened view. I look forward to reading future reports which discuss drivers' licenses data and children's online privacy, and the Internet of Things (ioT). View the "2016 Data Breach Litigation Report" by Bryan Cave LLP. 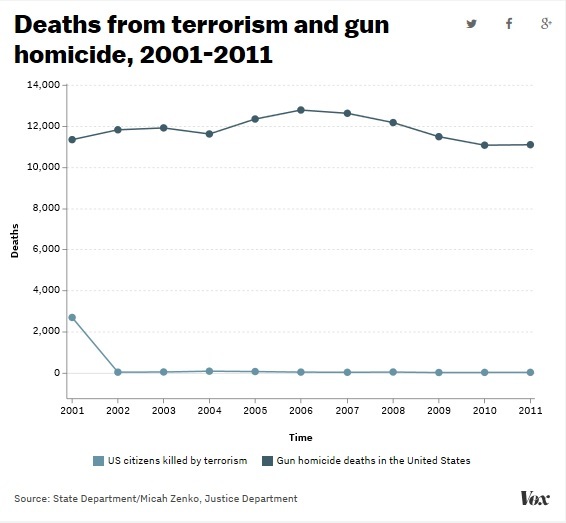 Below is another chart from the report. "84 percent of the US FDA-approved apps tested did not adequately address at least two of the Open Web Application Security Project (OWASP) Mobile Top 10 Risks. Similarly, 80 percent of the apps tested that were formerly approved by the UK National Health Service (NHS) did not adequately address at least two of the OWASP Mobile Top 10 Risks... 95 percent of the FDA-approved apps, and 100 percent of the apps formerly approved by the NHS, lacked binary protection, which could result in privacy violations, theft of personal health information, and tampering... 100 percent of the mobile finance apps tested, which are commonly used for mobile banking and for electronic payments, were shown to be susceptible to code tampering and reverse-engineering..."
"Many mobile apps are not medical devices (meaning such mobile apps do not meet the definition of a device under section 201(h) of the Federal Food, Drug, and Cosmetic Act (FD&C Act)), and FDA does not regulate them. Some mobile apps may meet the definition of a medical device but because they pose a lower risk to the public, FDA intends to exercise enforcement discretion over these devices (meaning it will not enforce requirements under the FD&C Act). The majority of mobile apps on the market at this time fit into these two categories. Consistent with the FDA’s existing oversight approach that considers functionality rather than platform, the FDA intends to apply its regulatory oversight to only those mobile apps that are medical devices and whose functionality could pose a risk to a patient’s safety if the mobile app were to not function as intended. This subset of mobile apps the FDA refers to as mobile medical apps." 80 percent of mobile app users would change providers if they knew the apps they were using were not secure. 82 percent would change providers if they knew alternative apps offered by similar service providers were more secure." Arxan commissioned a a third party which surveyed 1,083 persons in the United States, United Kingdom, Germany, and Japan during November, 2015. 268 survey participants were I.T. professionals and 815 participants were consumers. Also, Arxan hired Mi3 to test mobile apps during October and November, 2015. Those tests included 126 health and financial mobile apps covering both the Apple iOS and Android platforms, 19 mobile health apps approved by the FDA, and 15 mobile health apps approved3 by the UK NHS. Demand that app developers disclose upfront the security methods and features in their apps. The infographic below presents more results from the consolidated report. Three reports by Arxan Technologies are available: consolidated, healthcare, and financial services. The Consumer Financial Protection Bureau (CFPB) recently released a report about debt collection scams. The report is based upon more than 834,00 complaints filed by consumers nationally with the CFPB about financial products and services: checking and savings accounts, mortgages, credit cards, prepaid cards, consumer loans, student loans, money transfers, payday loans, debt settlement, credit repair, and credit reports. Complaints about debt collection scams accounted for 26 percent of all complaints. "Consumers complained about receiving multiple calls weekly and sometimes daily from debt collectors. Consumers often complained that the collector continued to call even after being repeatedly told that the alleged debtor could not be contacted at the dialed number. Consumers also complained about debt collectors calling their places of employment... Consumers complained that they were not given enough information to verify whether or not they owed the debt that someone was attempting to collect. " "... were Encore Capital Group and Portfolio Recovery Associates, Inc. Both companies, which are among the largest debt buyers in the country, averaged over 100 complaints submitted to the Bureau each month between October and December 2015. In 2015, the CFPB took enforcement actions against these two large debt buyers for using deceptive tactics to collect bad debts." "Of the five most populated states, California (10 percent) experienced the greatest percentage increase and Illinois (-4 percent) experienced the greatest percentage decrease in debt collection complaints..."
The report lists 20 companies with the most debt-collection complaints during October through December 2015. The top five companies with with average monthly complaints about debt collection are Encore Capital Group (139.3), Portfolio Recovery Associates, Inc. (112.3), Enhanced recovery Company, LLC (65.7), Transworld Systems Inc. (63.7), and Citibank (54.7). This top-20 list also includes several banks: Synchrony Bank, Capital One, JPMorgan Chase, Bank of America, and Wells Fargo. While the March Monthly Complaint Report by the CFPB focused upon debt collection complaints, it also provides plenty of detailed information about all categories of complaints. From December 2015 through February 2016, the CFPB received on average every month about 6,856 debt collection complaints, 4,211 mortgage complaints, 3,556 credit reporting complaints, 2,021 complaints about bank accounts or services, and 1,995 complaints about credit cards. Most categories showed increased complaint volumes compared to the same period a year ago. Only two categories showed a decline in average monthly complaints: credit reporting and payday loans. Debt collection complaints were up 6 percent. "Of the five most populated states, New York (12 percent) experienced the greatest complaint volume percentage increase, and Texas (-8 percent) experienced the greatest complaint volume percentage decrease from December 2014 to February 2015 to December 2015 to February 2016." 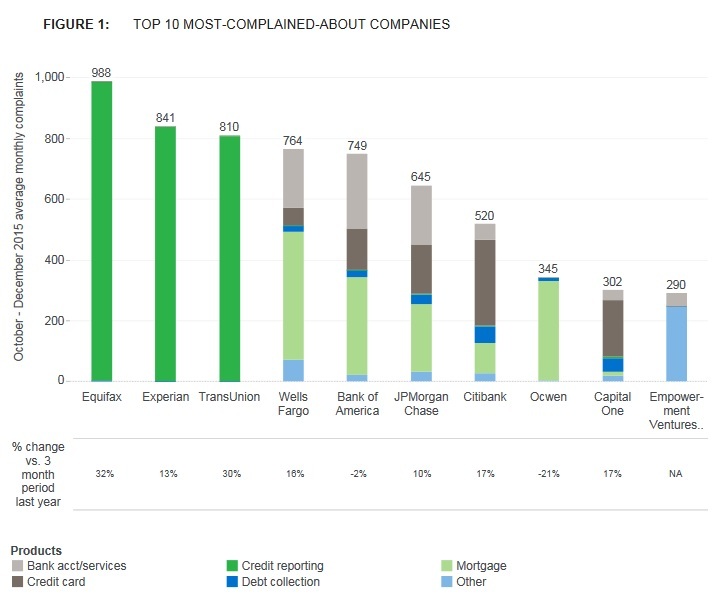 "By average monthly complaint volume, Equifax (988), Experian (841), and TransUnion (810) were the most-complained-about companies for October - December 2015. Equifax experienced the greatest percentage increase in average monthly complaint volume (32 percent)... Ocwen experienced the greatest percentage decrease in average monthly complaint volume (-18 percent)... Empowerment Ventures (parent company of RushCard) debuted as the 10th most-complained-about company..."
To learn more about the CFPB, there are plenty of posts in this blog. Simply enter "CFPB" in the search box in the right column. 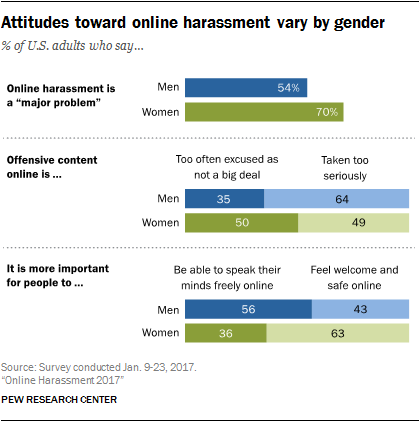 A few weeks ago, the Pew Research Center released the results of survey about adults in the United States that don't use the Internet. You're probably thinking: everyone uses the Internet. Right? Afterall, 64 percent of Americans have smartphones and 19 percent of them use their phones to go online. Actually, a substantial chunk of the population doesn't go online. The Pew Research Center survey described American adults who don't use the Internet. 14 percent used the Internet previously and stopped. What to make of this? I look at the people who said Internet access is too expensive or they don't have access. While overall our country appears strong, there are areas of the country were citizens lack one or several services we all take for granted. There are Internet deserts, broadband deserts, banking deserts, public library deserts, and food deserts. "America's unique problem with gun violence: American has six times as many firearm homicides as Canada, and 15 times as many as Germany... America has 4.4 percent of the world's population, but almost half of the civilian-owned guns around the world... 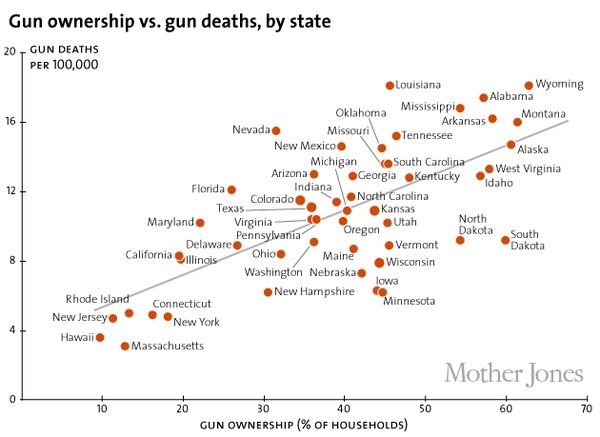 There is a mass shooting almost every day in America... States with more guns have more gun deaths... States with tighter gun control laws have fewer gun-related deaths... In states with more guns, more police officers are also killed on duty..."
To learn more, browse the charts Vox has assembled. "Of America’s 30 largest corporations, seven (23 percent) paid their CEOs more than they paid in federal income taxes last year... Of America’s 100 highest-paid CEOs, 29 received more in pay last year than their company paid in federal income taxes—up from 25 out of the top 100 in our 2010 and 2011 surveys." "... 237 subsidiaries in tax havens. The company with the most subsidiaries in tax havens was Abbott Laboratories, with 79. The pharmaceutical firm’s CEO paycheck was $4 million larger than its IRS bill in 2013. Of the 29 firms, only 12 reported U.S. losses in 2013. At these 12 unprofitable firms, CEO pay averaged $36.6 million—more than three times the $11.7 million national average for large company CEOs..."
"The company that received the largest tax refund was Citigroup, which owes its existence to taxpayer bailouts. In 2013, Citi paid its CEO $18 million while pocketing an IRS refund of $260 million. Three firms have made the list in all three years surveyed. Boeing, Chesapeake Energy, and Ford Motors paid their CEO more than Uncle Sam in 2010, 2011, and 2013." "... Restoring elementary and high school teaching jobs lost to recession and austerity budget cuts... Resurfacing 22,240 miles of four-lane roads... Running the U.S. Department of Veterans Affairs for two months... Making pre-K [educaton] universal..."
"For corporations to reward one individual, no matter how talented, more than they are contributing to the cost of all the public services needed for business success reflects the deep flaws in our corporate tax system. Rather than more tax breaks, Congress should focus on addressing these deep flaws by cracking down on the use of tax havens, eliminating wasteful corporate subsidies, and closing loopholes that encourage excessive executive compensation." "... the CUT Loopholes Act would close a variety of loopholes that facilitate tax dodging through offshoring. This bill would treat the foreign subsidiaries of U.S. corporations, whose management and control occur primarily in the United States, as U.S. domestic corporations for income tax purposes. It would also force corporations to take the same expense for stock option grants on their tax returns as they report on their shareholder books... Passing this legislation would reduce the incentive to shift profits and jobs overseas and could raise an additional $189 billion over ten years without raising corporate tax rates... Corporate Tax Fairness Act (S. 250 and H.R. 694)... would eliminate the ability of corporations to defer tax payments on their offshore profits. Instead, all worldwide profits earned by U.S. corporations would be immediately taxable in the United States. Firms would receive a dollar-for-dollar tax credit for any taxes paid to foreign governments. Corporations earning their profits in places like the United Kingdom, Germany, or France, where effective corporate tax rates are similar to U.S. rates, would pay little if any additional tax to the U.S. government. But firms stashing their profits in offshore tax havens would be forced to pay up for their years of tax haven abuse. The bill would raise an estimated $590 billion over ten years." Download the report, "Fleecing Uncle Sam" (Adobe PDF). A copy is also available here. Facebook is not just about lolcats, selfies, and epic partying. More people get their news from Facebook and Twitter. Pew Research reported several findings from a recent survey of 2,035 U.S. adults. 63 percent of users get their news from the Twitter and Facebook. Both social networking services saw increases. In 2013, it was 52 percent for Twitter users and 47 percent for Facebook users. The number of adults using both services (17 percent use Twitter and 66 percent use Facebook) remained fairly constant during this period. "Twitter news users are more likely than their counterparts on Facebook to report seeing news about four out of 11 topics: national government and politics (72% vs. 61%), international affairs (63% vs. 51%), business (55% vs. 42%) and sports (70% vs. 55%)... The rise in the share of social media users getting news on Facebook or Twitter cuts across nearly every demographic group... When it comes specifically to news and information about government and politics, Facebook users are more likely to post and respond to content, while Twitter users are more likely to follow news organizations." "... its long-rumored news feature, “Project Lightning.” The feature will allow anyone, whether they are a Twitter user or not, to view a feed of tweets, images and videos about live events as they happen, curated by a bevy of new employees with “newsroom experience.” And, in early 2015, Twitter purchased and launched the live video-streaming app Periscope... in May, Facebook launched Instant Articles, a trial project that allows media companies to publish stories directly to the Facebook platform... in late June, Facebook started introducing its “Trending” sidebar to allow users to filter by topic and see only trending news about politics, science and technology, sports or entertainment."